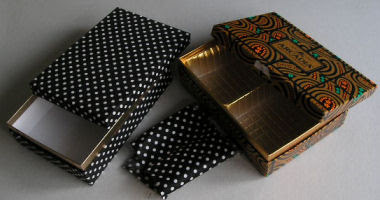 An empty box (or can) of cookies or candies is usable as a cabinet for buttons, beads, and other small things. Such box often has pigeonhole. If you don't like the patterns of the box, or there is ugly vestige of seal, why not glue beautiful cloth on it? 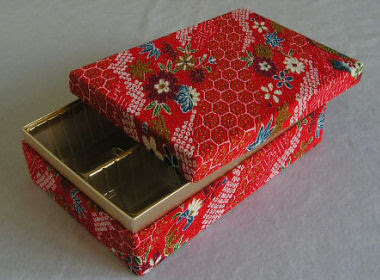 A box covered with chirimen (Japanese cloth). Here are patterns of ferret. I have no energy to explain the process in detail. Usually, animal making has common method. These pages will be useful about sewing, stuffing, or trimming. If you have done it fine, please post its picture on my guest board. And answer other people's question about making.